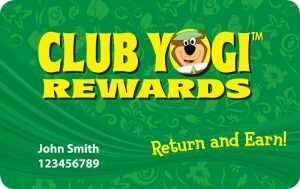 Present your membership card in the Jellystone Park store to receive five Club Points for every qualified dollar spent. Gold Tier Members earn seven Club Points for every qualified dollar spent. Points are earned after the stay is completed and may take 7-10 days after the departure to post to your account. *Note – Because technologysystems vary per Jellystone Park, qualified dollars will vary by location.